So the site was formed over the Christmas of 2011 as somewhere for me to place some of my weird and wonderful but almost always crazy ideas. I hope to be putting a lot of ideas and projects up for others to see/copy/improve upon. All ideas, projects, content and comments are offered here without any warranty or garentee. It is up to YOU to make sure YOU do things correctly and DON’T hurt yourself. Well to be honest – there isn’t a lot to me, just the average guy with an interest in many things including some crazy things. I like maths, physics and making things (usually a mess). I also have had an interest in production, sound and light from a young age. Professionally I have worked in IT, as a Youth Worker and freelanced in the entertainment industry along with putting many “gig’s” on for friends and associates. I’m not going to name drop here but I have worked with many artists and groups you might see on TV or hear on commercial radio stations. I enjoy problem solving and I’m usually found of an evening designing a solution to a problem (or making a problem). 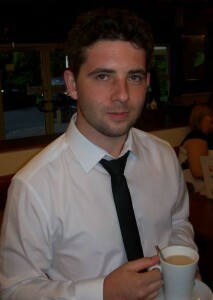 Oh and my name is Matthew and here’s a pic of me drinking tea, which is something I like greatly.